Carlisle United have signed a lock out agreement with an unnamed developer for their stadium project, but not at the proposed Kingmoor Park. The initial plans, released in November 2011, earmarked the Kingmoor site. However, Kingmoor Park Properties boss Tony Goddard told the News & Star newspaper it would not be on that site. Carlisle's managing director John Nixon told BBC Radio Cumbria they are working with a developer and architects for a ground "in and around the city". Nixon added that United will work with the developers to select the commercial ventures that will help to fund the stadium with further investment "of around £40-80m". He said: "It's a very difficult job and these things take time. "You've got to get the right developer, the right situation, the right ground and the right finance package that isn't going to pull the club down. "We've got to have a football club playing here - Carlisle United - playing in the Football League in the future." 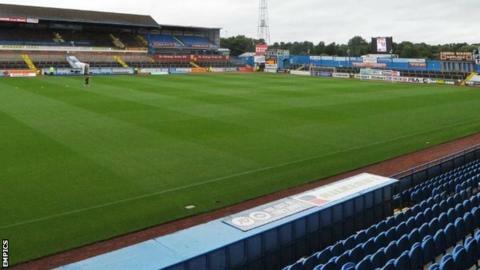 Brunton Park, the Cumbrians' home since 1909, is suitable for League One and Two under current Football League regulations, but is not an all-seater venue.